Following in the footsteps of Apple, Amazon has decided to ban a popular BitTorrent client because it "can be used to facilitate piracy." The developer of the FrostWire Android app is perplexed and stresses that his software only promotes free and legal downloads. Taking “infringing” apps out of popular app stores is one of Hollywood’s key anti-piracy priorities for the years to come. Various copyright holder groups frequently report “piracy-enabling” apps to Apple, Google, Microsoft and Amazon, alongside requests for the stores to take them offline. The stores themselves also screen for potentially problematic software. Apple, for example, has notoriously banned all BitTorrent related apps. This week, Amazon is following in Apple’s footsteps by banning one of the most used BitTorrent clients from its store. 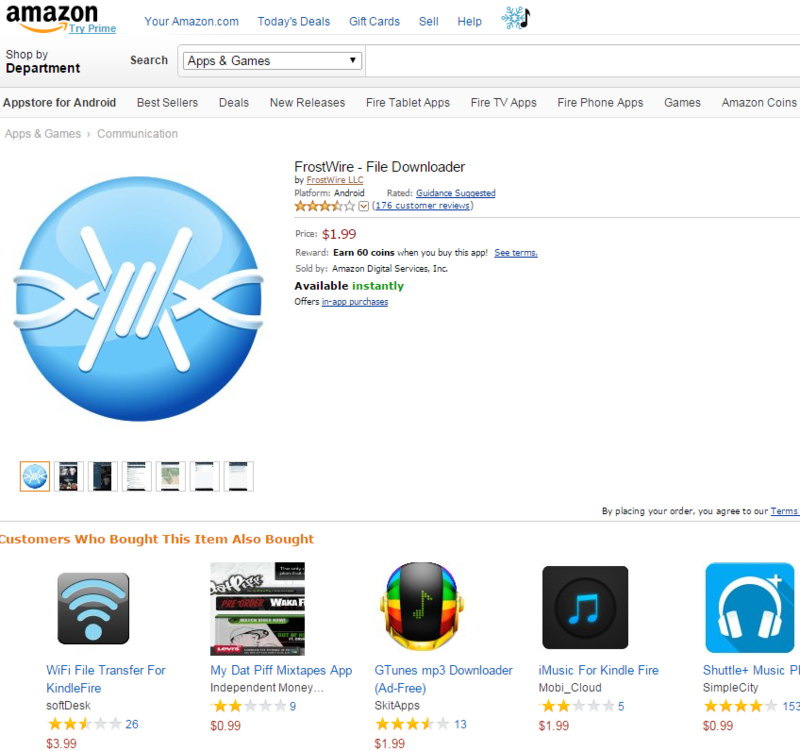 The Android version of FrostWire had been listed for well over a year but Amazon recently had a change of heart. FrostWire developer Angel Leon tells TF that the app was removed without prior warning. When he asked the company for additional details, he was told that Amazon sees his app as a pirate tool. “In reviewing your app, we determined that it can be used to facilitate the piracy or illegal download of content. Any facilitation of piracy or illegal downloads is not allowed in our program,” Amazon’s support team writes. Leon was baffled by the response. FrostWire had been a member of the Developer Select program for over a year and always made sure to avoid any links to piracy. On the contrary, FrostWire was actively promoting Creative Commons downloads and other legal content. “We have never promoted illegal file sharing, we actually promote creative commons downloads, and free legal downloads from soundcloud, archive.org. The app is also a full blown music player, but none of this probably counts,” Leon tells us. “Web browsers and email clients are still there, programs that also fall in the category of being ‘used to facilitate the piracy or illegal download of content’,” he adds, pointing out the arbitrary decision. While it’s not clear why Amazon changed its stance towards FrostWire, it wouldn’t be a surprise if pressure from copyright holders played a role. FrostWire’s developer believes that the mobile developer industry may have to come up with a less censorship prone store in the future. There’s a need for a decentralized app store that secures the interests of both iOS and Android developers. For now, Leon hopes that other stores will be less eager to pull the plug on perfectly legal apps. While it may seem to be a small decision for the stores, having a popular app removed can ruin a developer’s entire business. The beauty of FrostWire and other BitTorrent clients is that they offer the freedom to share files with people from all over the world without being censored. Restricting access to apps that make this possible will harm society, Leon believes. “This is a freedom which eventually protects society from the likes of totalitarian governments, something some of us at FrostWire have lived first hand in Latin America, something that forced me and so many Venezuelans to leave our countries and start again from scratch in the US,” Leon concludes. Despite being banned from Amazon’s store, Kindle users will still be able to get updates via the FrostWire website. A special installer for Kindle will be available soon.